Ocular chemical injuries are common and serious ocular emergencies. They represent 11.5%–22.1% of all ocular traumas and require immediate and intensive evaluation and care. The victims of such injuries are usually young men aged 20–30 years, and therefore, vision loss could dramatically affect their remaining lifetime with more number of disability years. Although the clinical course of the disease is divided into immediate, acute, early, and late reparative phases, the prognosis is strongly associated only with the degree of limbal, corneal, and conjunctival involvement at the time of injury., The goals of therapy are to restore corneal clarity, normalize the ocular structure, and prevent any glaucomatous damage from taking place. Treatment starts with simple vision-saving steps and is continued with complicated surgical procedures such as limbal stem cell transplantation, amniotic membrane transplantation, and ultimately keratoprosthesis depending on the patient's needs. Alkali injuries are more frequent than acid injuries. Majority of the chemical eye injuries occur as a result of industrial hazards. A few injuries occur in the domestic setting or secondary to assault. This case report underlines the potentially devastating ocular implications of an alkali injury from chemical fumes (Japan black) and intense arc light during film shooting. A mass casualty (group of 17 filmmakers) reported with severe irritation in eyes, along with watering, redness, photophobia, and blepharospasm following 12 hours of film shooting with Japan black [Figure 1] mixed with kerosene poured on the road to make it more dazzling. All the 17 patients [Table 1] were asymptomatic at first, but as the day progressed, Japan black mixed with kerosene became volatile due to high ambient temperature and intense hydrargyrum medium-arc light which was used for shooting. These volatile chemical fumes were toxic to the eye making all 17 patients symptomatic. Early irrigation with normal saline was started for all patients after a drop of topical anesthetic (proparacaine 0.5%) was instilled to enhance patient comfort. Flourescein staining was done, and slit lamp examination was carried out under cobalt blue filter. 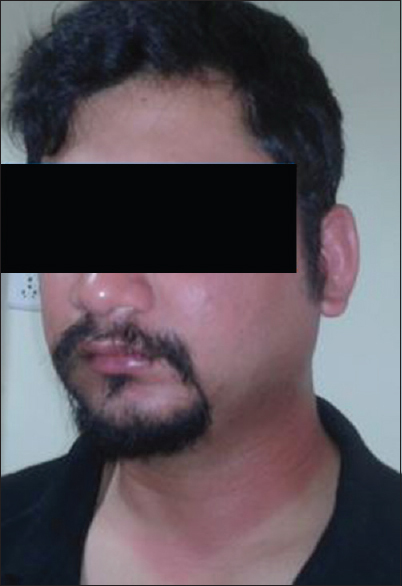 It revealed signs of chemical conjunctivitis (17 patients, 100%) [Figure 2], keratoconjunctivitis (15 persons, 88.23%), dermatitis (5 persons, 29.41%) [Figure 3], and eyelid edema (2 persons, 11.76%). Supportive treatment with antibiotic (moxifloxacin eye 0.5% eye drop, 6th hourly), soft steroid (loteprednol 0.5% eye drop, 8th hourly), cycloplegic (homatropine 2% eye drop, 12th hourly), lubricant eye drop (carboxymethylcellulose 0.5%, 2nd hourly), and rest in the dark room helped in resolving of symptoms in all except one within 48 hours. One patient with a history of Laser in situ keratomileusis (LASIK) done in both eyes was referred to a cornea specialist for further management due to lack in the improvement of symptoms and signs after 48 hours. Japan black (also called black Japan) is an alkali. It has an asphaltic base dissolved in naphtha or turpentine and is used as a varnish which is suitable for many substrates such as iron and steel. It is also high in bitumen content, thus providing a protective finish that is durable and dries quickly. Due to these properties, film-shooting personnel use Japan black to make the roads more dazzling for film shooting. However, the problem occurred due to the addition of kerosene to the paint (Japan black). It is a well-known fact that painters usually add all sorts of things to their paints for painting. Some of these practices were secrets of their trade. One such substrate that is added to the paint is kerosene, as observed in this scenario. Kerosene is preferred to other solvents by painters, because, when added to paint it dries up slowly, slower than any other solvents. Because of this slow-drying property, it is also preferred by painters when painting in really hot weather. However, the problem with kerosene is despite its multicomponent nature, and the evaporation of kerosene follows the d2-law after heating up, i.e., the evaporation rate of kerosene droplet increases monotonically with an increase in gas temperature. In our case scenario, there was an increase in the ambient gas temperature due to film shooting with intense hydrargyrum medium-arc iodide (HMI) lamp. The mercury vapor and the metal halides in HMI which emits light created the high ambient gas temperatures which made the kerosene vaporize along with Japan black. These chemical fumes took approximately 12 hours to get formed. That is why the shooting team did not have any symptoms during shooting which was approximately for 11 hours. Moreover, as soon as they wrapped up the shooting, they all became symptomatic, and they panicked as they had no clue what is happening creating an environment of unrest. Japan black being an alkali caused damage to the ocular surface by change in pH, ulceration, proteolysis, and collagen synthesis defects. They are also lipophilic, thus penetrating the eye more rapidly than acid by saponification. Common alkalis that cause ocular injury are ammonia, potassium hydroxide, lye, magnesium hydroxide, and lime. However, in this scenario, we report an unusual alkali (Japan black) which led to an event of mass casualty in a group of filmmakers. This has never been reported in literature before. 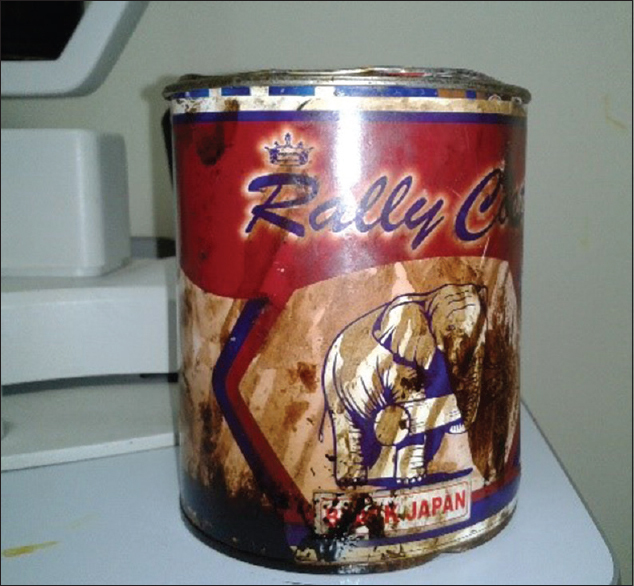 This case report highlights the need for awareness about Japan black as a cause of serious chemical ocular injuries among filmmakers, especially when mixed with kerosene. Colby K. Focal points. 2010;28:1-14. Clare G, Suleman H, Bunce C, Dua H. Amniotic membrane transplantation for acute ocular burns. Cochrane Database Syst Rev 2012;9:CD009379. Singh P, Tyagi M, Kumar Y, Gupta KK, Sharma PD. Ocular chemical injuries and their management. Oman J Ophthalmol 2013;6:83-6. McCulley JP. In: Smolin G, Thoft R, editors. Chemical Injuries in the Cornea: Scientific Foundation and Clinical Practice. Boston, Mass, USA: Little Brown and Company; 1987. Fish R, Davidson RS. Management of ocular thermal and chemical injuries, including amniotic membrane therapy. Curr Opin Ophthalmol 2010;21:317-21. Eslani M, Baradaran-Rafii A, Movahedan A, Djalilian AR. The ocular surface chemical burns. J Ophthalmol. 2014;2014:196827. Wagoner MD. Chemical injuries of the eye: Current concepts in pathophysiology and therapy. Surv Ophthalmol 1997;41:275-313. Solvents Industry Group: Solvents Industry Group. Available from: http://www. Americansolventscouncil.org. Archivedfromtheoriginalon007-06-13. [Last retrieved on 2009 Dec 08]. Hingst J. Adding Kerosene to Paint. 2016. Available from: https://www. linkedin.com/pulse/adding-kerosene-paint-jim-hingst. [Last accessed on 2018 Aug 13]. Ghassemi H, Baek SW, Khan QS. Experimental study on evaporation of kerosene droplets at elevated pressures and temperatures. Combust Sci Technol 2006;178:1669-84.